It’s flu season again, and the dominant flu strain this year is called H3N2, which is just a fancy term for yet another brand of flu virus that uses dirty politics to get inside your body and make you feel like crap about the world in general. This year’s strain of the flu is flattening people Right and Left. It cares not whether you are Democrat, Republican or Libertarian. It doesn’t care what race or creed you are. It only cares that you are human and yummy. Flu viruses like to live and grow in human beings. It’s as simple as that. That means that no matter where you live, in a Red or Blue state, you need to learn about the dirty politics of the flu and take precautions against it. The most common move people make to avoid getting the flu is to get a vaccination. A vaccination works by reinforcing your natural constitution using an injection of dead flu virus to help your body generate antibodies that fight the flu from the inside out. Getting vaccinated is essentially like turning bad guys into good guys, because the vaccination introduces dead flu germs into your body so that it learns to recognize the “bad guys” and uses natural disease-fighting processes to build up immunity. There are potential drawbacks to vaccinations. Flu vaccinations use some chemicals that some people think are just as bad for your body as the flu itself. Plus, flu viruses are known to vary in their genetic makeup. That means the vaccination you get may not produce the exact kind of antibodies needed to fight the strain of flu you’ve contracted. That is not good, because it means you’ll get some form of the flu anyway. And that means you’ll get to barf and poop and cough and hack away with the rest of us. The flu is really democratic that way. So what else can you do to avoid the flu? Many people believe building up natural immunity with good diet and overall good health practices is the best defense. But you can also start a really good campaign against the flu virus using modern technology, especially tools that kill the flu virus and other germs before they get to you. It’s true! There really are ways to combat the flu before it gets to you. 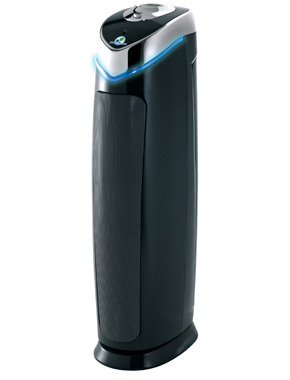 The Germ Guardian 3-in-1 Air Cleaning System uses UV-C technology to kill flu, strep, common cold virus and bacteria in the air you breathe. It also traps airborne allergens using true HEPA Filtration to eliminate 99.97% of the stuff you breathe that can make you cough and wheeze whether from allergies or asthma. It also filters out pet dander, mold spores, pollen, household dust (and dust mites). The Activated Carbon Charcoal Pre-Filter in the Germ Guardian delivers odor control too, so that even if someone in your life does get the flu, you won’t be trapped inside breathing stale and loathsome fumes that can you feel just as sick. After all, one rule of politics is that ideas often define our reality. The same is true with the flu. If you think you’re getting sick you just might do so. You can stop the flu right at the gateway of your mouth using the Zadro UV Toothbrush Disinfectant Scanner to prevent the spread of colds and flu. The UV light in the toothbrush scanner kills whatever viruses and bacteria remain on your toothbrush after brushing and rinsing. The scanner works quickly, fits neatly over your toothbrush, and can do double duty as a toothbrush travel case, so you can take it with you. No more worry about those germs on the hotel sink, just trust the UV Toothbrush Scanner to kill viruses and feel good about brushing your teeth any time you want. This flu has no mercy on you. Why show mercy to the flu? Make a smart political move and knock out the flu right out of the human race with the Nano UV Wand Large Area Disinfection Scanner. The UV Scanner disinfects 99.9% of all viruses that cause colds and flu. The 10-second scanner eliminates flu viruses as well as SARS, E.Coli, salmonella, bacteria and molds. Want portable satisfaction and flu prevention wherever you go? 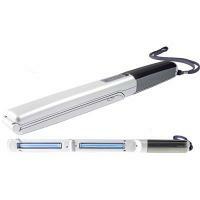 The Zadro NANO-UV Disinfection Light Scanner is the size of a cell phone and goes absolutely everywhere. Zap flu and cold viruses, bacteria and other germs off grocery carts, restaurants, hotel rooms and public restrooms. You can even use this device (or the Large Area Disinfection Scanner) to kill bed bugs and dust mites at home or wherever you travel. Both are great for eliminating allergens too! UV Scanners might just be your best friend in the whole world when it comes to keeping you safe and healthy. It’s time to cast your ballot and elect not to get the flu this year. AllergyAsthmaTech.com is where you can start by punching your anti-flu ticket. We even promise not to needle you about getting a vaccination.